Porth Nefoedd is back in the spotlight again with a flurry of activity in the last week. The crag, which sits around the headland towards Hell’s Mouth from Porth Ysgo, was first developed in 2003 (by Paul Higginson and Jon Ratcliffe) and documented in issue 131 of On the Edge magazine. 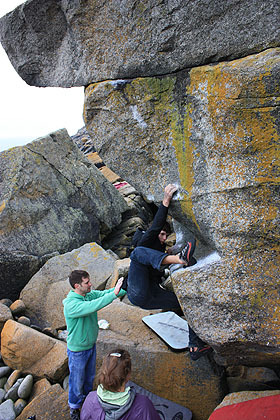 Despite having classic problems such as Seams Choughed 7A it has seen very little traffic in the last decade - that may all change when the new guide arrives. Last Thursday Si Panton climbed Bat Man 6C, a splendid right-to-left traverse of the steep lower wall of the ‘Bat Cave’ behind Fur Trade. From a sds on the upper level, matched on a sloper, monkey leftwards along the line of holds and exit out onto the slab to finish. On Saturday Jon Ratcliffe (back in the game after a long injury break) extended the difficulties with The Bacon Butty Start 7A+. This starts sitting at the base of the outside arête on the lower level. 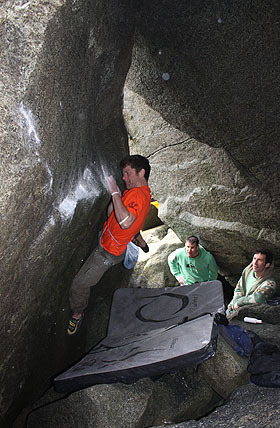 Slap up left to a slopey shoulder then gain the top sloping arête with difficulty. Traverse up left then make a hard drop into the start of the original and continue somewhat desperately. George Ullrich then added George’s Shelf 7A+, a tricky test of improvisation surmounting the first shelf on the Staring Through Windows traverse.